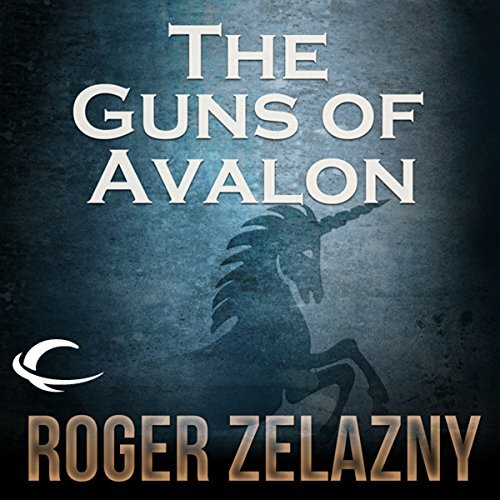 The Guns of Avalon is the second book of The Chronicles of Amber; an epic fantasy series written by six- time Hugo Award winning and three-time Nebula Award winning author, Roger Zelazny. 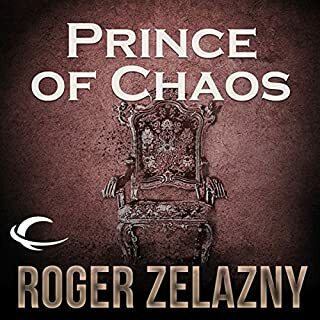 ©1972 Roger Zelazny (P)2012 Audible, Inc.
We can be brief in part, because if you are considering this book, you likely already picked up “Nine Princes in Amber” and if you haven’t I strongly recommend that you do. I am not sure the story will be an easy one to pick up at this point. This story is just as fine as the last, and the journey is as wonderful as I remember. Corwin’s plan to reclaim what he views as his right and revenge himself upon Eric while at the same time struggling with the harm he has done and trying to fit all of this within his new (within the life of an immortal anyway) found morality and empathy drives the story and prepares him for what comes next. As for the performance, it’s still better than many I have heard. However, some of the voices are still troubling me. 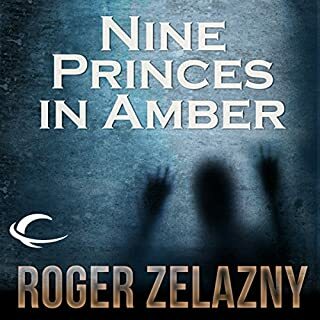 I’m not sure why Texan and Southern accents are slipping into the voices of nobles from Amber and the Courts, but it might be a bit silly to find that troubling. After all, why not? These are people who can travel to any reality and live there for centuries. Still, I found a few of the voice choices at odds with how the character is presented in the story. However, Corwin’s voice is just fine, and that’s the one we hear for most of the tale. And remember to be on the lookout for the famous quote that is the title of this review! 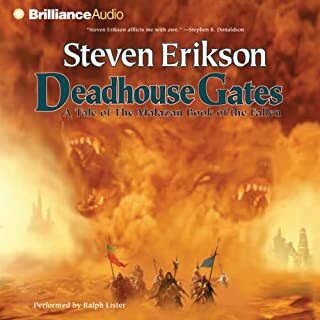 I’m listening to Alessandro Juliani narrate Audible Frontiers’ version of The Guns of Avalon. He’s doing a great job, though I did not like the Southern drawl that he chose for two of the major characters (they call it “Ambuh”). It didn’t seem appropriate. With so many characters, I think he feels that he must give each a distinctive voice, so to do that he’s using unlikely accents or vocal properties (e.g., hoarseness or high pitch) to make them unique. I think that’s a mistake, but other than that, his reading is very good. Oh my God, can we please lose the accents!? What did you like best about The Guns of Avalon? What did you like least? 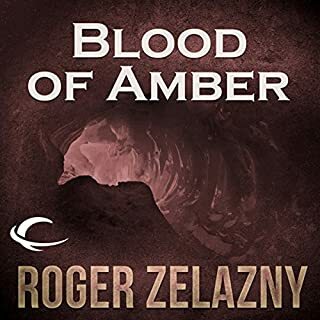 I have loved the Amber series for nigh on thirty years, since I first discovered it as a teen ager. This series is magical in its language, portrays fascinating personal and moral struggles set against a tremendously imagined world. All this I love. The narration is decidedly the weak point in this rendition. What didn’t you like about Alessandro Juliani’s performance? It might be easier to sum up what I liked. His Corwin is well done, with a good grasp of the character. Just about everyone else is a miss. In this performance, the character of Ganalon is turned into an upper-class twit, and somehow Benedict and Dara become refugees from the Ante-Bellum South. Random remains a cross between someone from the Revenge of the Nerds and a really bad Peter Lorre on meth. Did The Guns of Avalon inspire you to do anything? Yes, write a scathing review of a performance, something I am not usually called upon to do on this otherwise wonderful site. 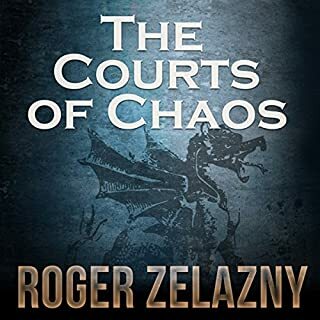 I gave the book three stars overall, despite my distaste for the narrator's choices in characterization. 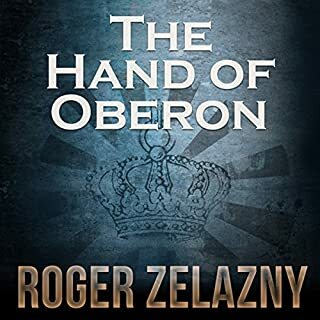 The Guns of Avalon is the weakest of the first five Amber books, having to do a lot of backing and filling and introduce large chunks of exposition that were necessarily delayed by the story conventions required in the first book by amnesia and a deft pacing that left no time to breathe, let alone fill in back story. Still, it's a four-star story for me, the only one that isn't five. I just wish Juliani didn't make a number of the characters sound like muppets, it makes me sad. 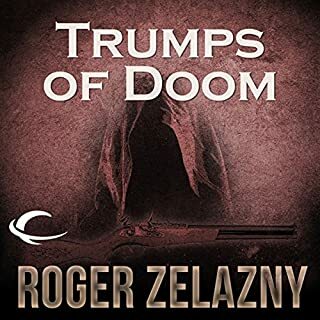 I'm afraid I can't really recommend the reading of this series here presented, and will only go on in a dimming hope it gets better, and since I already bought the bloody thing. 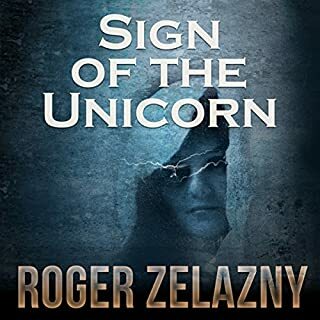 Again, like the first in this series, this isn't GREAT literature but it is entertaining enough and does have a compelling narrative drive to it. They are little trashy treats. 120 page pulp bites. It is nice to throw a couple of these in-between longer, more dense and serious reads. They are entertaining. this book is awesome. OnlY problem is it's too expensive. do worth it but still...way too expensive. 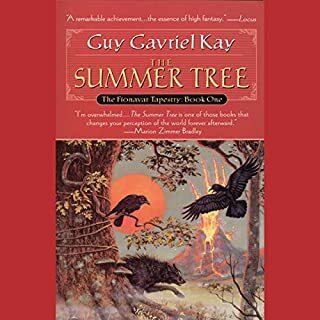 What made the experience of listening to The Guns of Avalon the most enjoyable? The voices were not very good, Random's was too whiny and giving Benedict and Dara a southern accent was a bit distracting and I believe in Nine Princes in Amber he had Gerard with a Scottish accent and it was gone in this book. 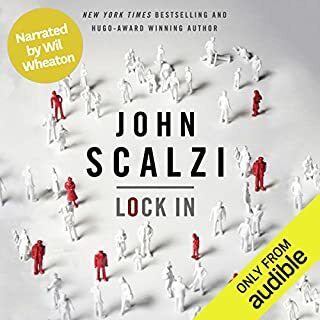 I very much enjoyed the first book and couldn't wait to get this one. I was just as good. Have you listened to any of Alessandro Juliani’s other performances before? How does this one compare? If you could sum up The Guns of Avalon in three words, what would they be? Corwin has always been one of my literary heroes, in a similar vein to the reluctant heroes of Moorcock's work and to Howard's Conan. 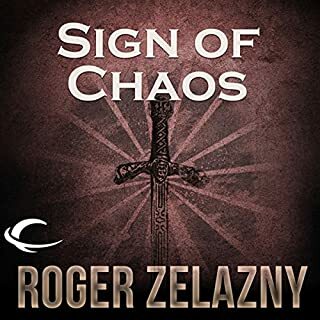 As the saga continues Corwin has the opportunity to revisit the past as reconstructured by his brother; rather than wallow in the regret of the past he sees how his brother Benedict has made good Corwin's mistakes. And so Corwin's journey continues, until corwin can grasp his dream. Mr Juliani's performance in Nine Princes in Amber was inspiring and here he continues to deliver the story as though it were real life rather than fiction from a truly great author. It's terrible when the narrator messes up a great story. 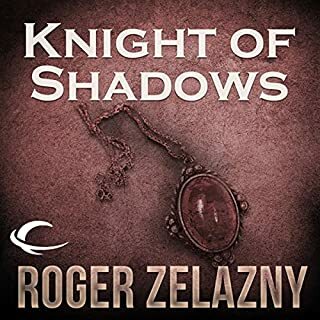 I love the Amber books, but this narrator makes half of the characters sound like driveling idiots... the whole five book story arc should be told in one voice, the voice of the protagonist as it is him narrating his story from his perspective at the end of it all.